Embrace the Awkward | All Around Dogs Embrace the Awkward | Thoughts on training and life with dogs. I was in a (human) training class today and heard a term that immediately caught my attention – “conscious incompetence.” The reason my ears perked up is that it put a name to something that has been rattling around in my brain for a while. It is the stage in learning when you feel awkward because you know what to do but you aren’t able to actually do it yet. It has happened to everyone at some point – learning to tie your shoelaces, drive a stick shift, or fold a fitted sheet (well, let’s admit it, that one is still awkward). Some people handle it better than others, but everyone goes through the same process of knowing the skill without being able to put it into action. I’ve finally come to the point in dog training where I don’t feel that way about everything but I still have plenty of new skills to learn. When I was working with an IPO trainer on dumbbell training, I got a very prompt reminder of how it felt. Four of my club members gathered around to watch because they were interested in learning his method too. So there I am with four people staring at me, trying to manage a clicker, treats, and the toy we were using because none of us had a dowel, while at the same time I’m listening to his instructions. I was clicking her when she did the wrong thing, telling her no for doing the right thing, and fumbling with treats. After a couple of attempts I had to stop and collect myself, thoroughly flustered. It’d been a while since I’d felt that awkward. But when I tried the new skill again, at home, I already found that I’d gotten better at it. There is still a lot to work on, but that piece is starting to fall into place. Go ahead, embrace the awkward. 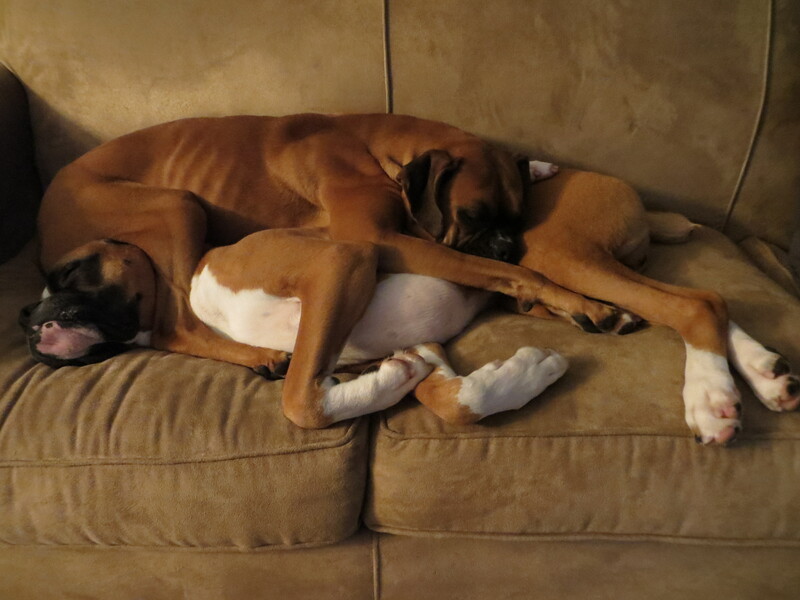 Boxers are very good at embracing the awkward.